Every bloggers need comments on their blog posts, not getting too many comments. Reader’s comments are valuable for every blogs to know how good is your article or content, is it helpful for them, boring to reading this article and many more. Every day we publish blog posts in our blog and when we see no one comments, we broke our heart and think no one like my content. 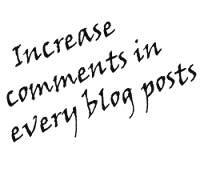 So today I decided to share some ways to increase comment in our blog posts. But you need to follow all steps carefully, otherwise you will lose. As we already know content is king. This is the most important and requirement part of every blogs. If you have not many quality content, you can’t success with your blog or it’s too hard. So if you need to increase comment count in your blog posts, you must need to publish quality content for your readers. Make sure before start writing content, just think is your article helpful or useful for visitors? Because if your content is useless for readers, they never like to comment in blog posts. When you get some comment. Reply to all of them for increase your blog comments count. People will see how many comments have in your blog. So new readers also like to comment in your blog posts. You can increase your comment by replying. When you writing content for your blog, just type some question mark question. That will helpful to get more comments in your blog posts, if your readers like to answer your comment. I’ve seeing too many popular blogs, they are asking some little question for increase their blog comments. So, it’s really a great way, you just need to try. This method only for WordPress user who are using WordPress platform. If you are Blogger user, ignore this method. You can use “Thanks me Later” WordPress plugin. When someone comments in your blog posts, they will get a instant email on their email. Something like, Thanks a lot for comment in our blog. WordPress users can use this plugin if you want. Thanks. Comment other blog posts it’s a great way to increase our own blog posts comments. Here is 2 benefits, one is you will get backlinks when someone click your site link and number two is, you will get more new readers and comments from other blogs. It’s a paid plugin for WordPress user. But you can use the commentluv option in blogger too for free. Visitors like this commentluv option to get backlinks from your site. It’s also a greatest way to attract your readers for comment in your blog posts. If your readers comment in your blog for help, try to reply comment with a quick solution. You will get positive comment and reputation. 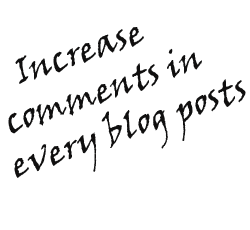 So, above all basic steps will helpful to increase comments in your blog posts. Now I will tell you what you need to ignore. Don’t allow spamming comments in your blog posts, delete it immediate when you see spam comments. Don’t spamming in other blogs to visit your site and comment. Don’t comment in your own blog posts (without replying). Thanks a lot for stay and reading my post. If you need any kinds of help about blogging or this post, feel free to comment here. I will glad to help you ASAP. Thanks again. Nice post with great information and I really enjoyed this post while reading. it is a nice one because it deals with an interesting ideas and information. I like it so much as from the first time i read it, the information that are used here attracted me a lot. They take my attention from the first look, so thanks so much for sharing with us this great topic in this great website. You are doing a great work here. I must say you've done a wonderful job by sharing your article with us. It took more time for me to read it fully, But it's worth it Really. I like the way you tied all the information together about stock. Thanks for sharing such informative and useful information which is very beneficial who want to know about Index And Stock Tips.